A few years ago I made a not very funny April's fool joke about trekking barefoot to save weight. Now the joke is on me since barefoot running shoes are all over the place at the moment. And if you can run in it, you can walk in it. Here is a small look at the current situation. when they were still white. 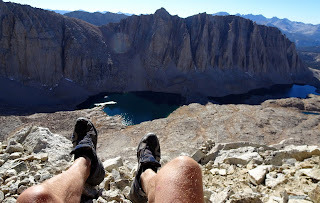 Backpacking in trail-running shoes made me wonder if support and cushioning is really vital. 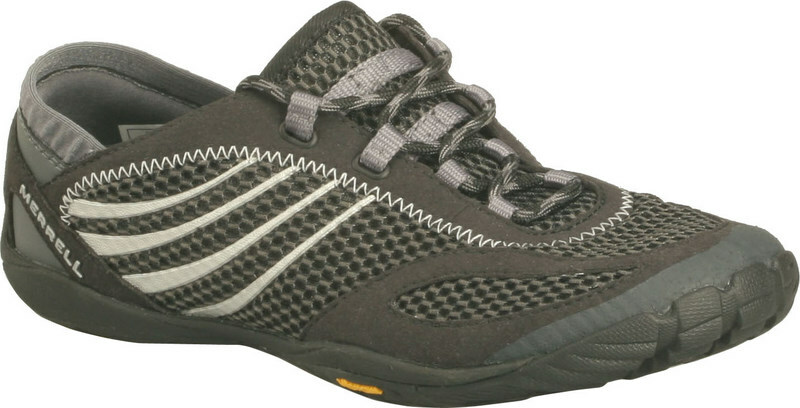 Seeing the hype around minimalist "barefoot" running shoes - without any cushioning or support - I was curious if there were any products suitable for lightweight backpacking. By asking nicely we received a pair of Vivobarefoot Evo from Terraplana, one of the first designated running shoes to compete with the Vibram Fivefingers. During this summer Fjäderlätt put them to the test for both everyday and backpacking use. What are the other alternatives until Terraplana makes a trail-running version? Not very many at the moment, but next year there will be quite a few. 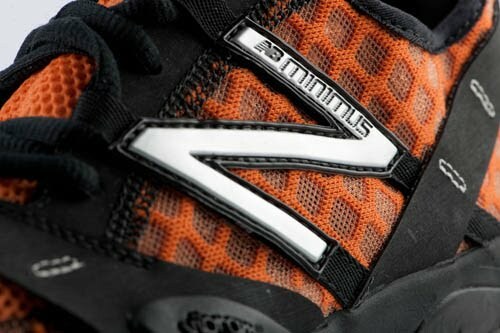 Our British lightpacking favorite will launch trail-running shoes without any cushioning called Baregrip 200. 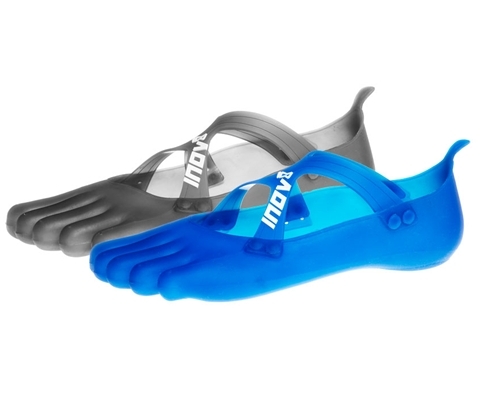 The most minimalistic "shoes" yet will be the Smurfy Fivefinger challenger Evoskin - a silicone glove for your feet. One of the new Road-X models might also be a moccasin. 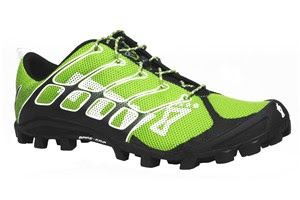 Inov-8 Evoskin. Less is Smurf. Merrell have teamed up with Vibram to create a less Hobbit-like collection than the Fivefingers, called Merrel Barefoot. 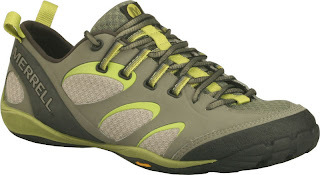 The most interesting shoes for trekking are the True Glove, Trail Glove and Pace Glove. New Balance will have at least three moccasin models. The Minimus Trail looks like it could be perfect for trekking. 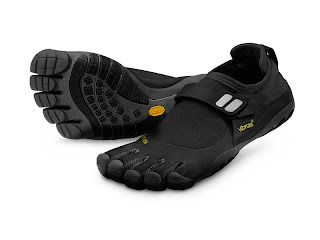 Vibram more or less stumbled into barefoot running with their now "de facto standard" Fivefingers and have expanded their range. 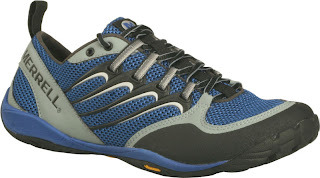 Many models to choose from, for example KSO, Bikila, Speed and the new Trek Sport. As you can see we are a quite excited about this trend. For it is a trend, complete with starry eyed evangelists and angry unenthusiasts. But the only way to find out if it is any good is to try it ourselves. Have we missed any good ones? Please leave a comment! GoLite's new BareTech line of shoes are somewhat barefoot. The new site should launch on the 15th but in the mean time you can see some of them on Zappos.com or various running blogs. Also, Soft Star Shoes has some barefoot running shoes. They're custom made per order and you can have them fitted for your particular feet. IMO, they're closer to barefooting than VFFs. Yes, I saw the Golites, but counted them out as too cushioned. The Soft Star Runamoc are really close to barefoot! A bit too much moccasin for my taste, but that's just me. Yet another alternative are ordinary Beach Shoes, in mesh or neoprene. The Merrels don't look too bad, and the Five Fingers Trek Sport look more sturdy - but then when they become more sturdy I start to wonder if there is any benefit to having five separate toes. The problem for me with most of these is going to be the toe box. The NB, Inov8 baregrip, and likely the Merrell are all far too narrow in the toe. This is a very common problem with almost all shoes today. I used a pair of Icebug Celeritas for a hike this summer. They resemble the Baregrip quite a lot - grippy sole, no cushioning and water-repellent materials. You could also try other classic orienteering/fell running brands like Jalas, VJ, Olway or Walsh. I bought my Icebugs one size up, to get enough room for warmer socks or waterproof socks. But I also ran barefoot in them and it was comfy too. During the hike I used thin nylon socks. I totally agree about the toe box. It's about styling I guess, but you would think these products were above tha (the Fivefingers certainly are :) ). If you can't spread your toes, and wrap your forefoot around the terrain, a large part of the freedom is lost. That is of course true for any shoe, but especially these. The roomy toe box is part why I like my Inov-8 Terroc 330. I've tried Inov8 295, 310, and 330. They're all too narrow for me, even if I go up a full size. 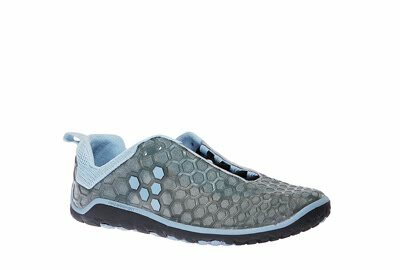 Take a loot at http://www.softstarshoes.com/images/products/250V/250V_run_red_top.jpg for what a shoe *should* look like. The Feelmax shoes have decent grip on most surfaces but the is totally no grip on slippery mud but thats true for most shoes. As I commented on Hendriks post about the VFF shoes there are a couple of reservations I have about such minimalist footwear. 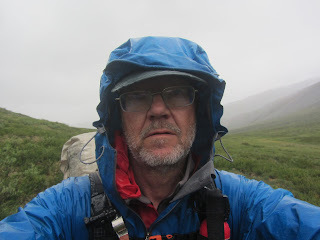 While I agree with the minimal heel lift, reduced motion control and lighter weight of minimalist footwear I feel that many of these models don't provide enough 'protection' from rough, rocky trails that we encounter here in western Norway, especially on longer trips. A lot of these shoes also try to shed weight by removing material from the side of the shoe, increasing the chance of stones, sand, thorns, etc from getting inside. The Inov8 200s are probably as 'minimal' as I will go. HHMMM, the soft star shoes are beautiful and that already 25 years. But how will perform the leather upperpart in wet circumstances? ?It is always wet in the woods where I live so real barefoot is maybe better. An advantage with barefoot walking is that you learn to almost 'feel' where you go.You will have to, because you will surely hit something which will hurt...But you can also make yourself a real moccasin and if you want glue a thin rubber sole under it, much cheaper I guess.But what is happening at the moment is interesting, I am especially interested in the soft star runamoc, how they will perform here in the wet Sweden. It will perhaps not be the thing most of you are looking for but I love (and truly love love love) my huaraches. Huaraches are traditional running footwear from the Tarahumara Indians and it is basically nothing more than a sheet of rubber with a leather string. For (by now) habitual barefooters like me it is ideal :). Next year there is a more amphibic version of the Evo coming, called Ultra. I've only seen it in white, but maybe there will be a black too?